This article was written by Craig Baker and published in the SHGA High Times on July 31, 1984. Those who started hang gliding in 1980 or later may not be aware of just how "new" this great flying site is, although the roots of hang gliding are here in Sylmar. Uncle Bill Bennet flew here in Sylmar in 1969, and the first U.S. Nationals competition was held in 1973 in Sylmar. The landing area was at the north end of Polk Street with takeoffs at various points along the May Canyon Truck Trail. Late one hot summer day in 1979 I was packing my glider in the old Sylmar landing area along with Gary Patmor, Dave Beerman, and Danny Black, when someone pointed high to the east and said, "Look, there's a bunch of gliders soaring above Kagel Mountain!" Questions were asked by all there that day and every weekend thereafter: Where is Kagel? Where's the landing area? Who are those pilots and where did they come from? No one knew the answers. 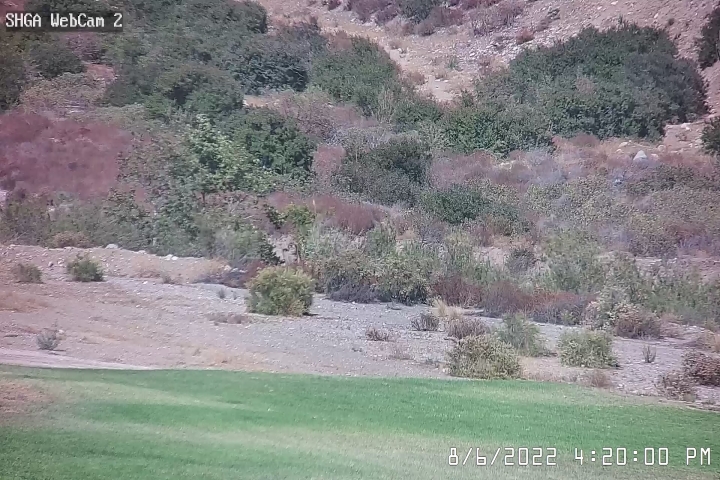 Later some of us tried driving to the north end of Kagel Canyon Road, but found no takeoff or landing areas. Finally one day, Danny said he'd heard from a friend who heard from someone else that you might get to the landing area if you take Polk Street south to the freeway and go east to Hubbard Street, exit, go north to Simshaw, and turn right. Danny of all people sent me three miles out of my way. In 1974, Phil Warrender and Rich Grigsby found the route to the top of Kagel Mountain and brought their standard gliders to where we now have the takeoff ramp. They noticed the wind velocity was constantly changing. The mountain in front seemed to be too much of a problem, with its expected lee-side sink and turbulence. So they drove back down, deciding that Kagel Mountain was not a good place to fly. In 1976, Phil Warre3nder joined Gary Valle and the late Jack Franklin to fly from Kagel Mountain when the road at Sylmar was closed due to fire hazard or road work. They test-flew gliders built at Sunbird Aircraft of Sylmar, a now-defunct manufacturer that was located near the Kagel landing area. Their landing area was up on the plateau near the base of the mountain, in tall brush. The glide ratio of the gliders they flew made it difficult to reach the area we use today at the east end of Simshaw. Those who flew the old Sylmar flying site knew of the soarability of Kagel Mountain because they had been flying cross-country to there. But the takeoff at Sylmar was more convenient, and during the late 1970s, no one flew Kagel regularly. Then on May 24, 1979, Rome Dodson went looking for another flying site to help do away with the crowds that had developed at Sylmar. He took Jack Jungerman with him up to the top of Kagel Mountain. The road was almost impassable, and they had to fill ruts with rocks on the way up. For some reason, they did not choose to fly from the area where our launch ramp is now. Instead, Rome and jack went to the point just to the right, where Eddie Tadeo likes to take off from today. There were burnt tree stumps that had to be cleared first. Their landing area was at the north end of Gridley Street, just north of where we land today. Having "discovered" a new flying site, Rome then went to the Southern California School of hang Gliding, now Windsports, to tell Rich Grigsby, who later tried teaching intermediate students there. This proved to be very successful. Soon Greg DeWolf and Larry Mace were teaching students at Kagel Mountain too. They also told other pilots who recently completed lessons to try flying Kagel. The disadvantages of flying Sylmar were its very small landing area, the cliff launch overlooking a paved road, and obstacles such as ridges and canyons between the takeoff point and the landing area. Kagel had none of these, and during the summer of 1979, became a very popular flying site for students and advanced pilots alike. As flights between Kagel and Sylmar became more common, the pilots at the Camp 9 heliport became concerned, and an air corridor was defined to help the situation. Today, this corridor is described in our Kagel Mountain Guidelines. The old Sylmar site had a beautiful new big landing area on Olive View Drive in 1981 when the State of California bought the land for a school and removed greenhouses form the lot. In mid 1983, this land was sold and construction of houses began. If the Sylmar hang gliding Association had been in existence only a few months sooner, perhaps the State would have allowed a flight park to be established. Back at the old landing area at the north end of Polk Street, pilots were told by the land owners that they were no longer welcome. Landing next tot he Olive View hospital brought warnings of fines for trespassing. Suddenly, the Kagel landing area was the only place left to land. Driving to the top of Kagel was a bit longer than it is now because the Foothill Freeway ended at the Simi Valley freeway. Pilots had to exit at Paxton and to Foothill Blvd. To get to Osborne and Little Tujunga Canyon Road. There was no ramp at takeoff until Dale Fedderson returned to the sport of hang gliding, after suffering spinal injuries while flying a powered hang glider, and cannot use his legs. His Seagull 10 meter has wheels, and takeoff is accomplished easily by simply rolling him off the hill. The ramp was originally built for Dale. Later it was extended to twice its length, to its current state. Jim McQueen was launching Dale once when he got too aggressive and ran all the way down and over the edge. He dislocated his shoulder, and Dale later made a safety belt with a rope for his assistants to wear (see Hang Gliding magazine, November 1982). A big part of the Kagel Mountain flying site for years was Jerry Carson's Kagel Shuttle. He turned an old bread truck into a bus and charged only $3 for a ride up with your glider (see Hang Gliding, September 1981). Jerry eventually became tired of all the driving and repairs to the old truck, so he sold it. The mountain in front of Kagel was found to be a good source of thermals, and a good place to escape the crowded skies over takeoff. In an effort to discourage other pilots from soaring this mountain, Pat Sheedy and others named it Trash Mountain, as if the air above it was trashy or rough all the time. For those of you who don't know it, Trash Mountain is actually a nice place to fly over and soar. Perhaps its time for a name change. A public telephone was installed at the north end of Gridley next to where pilots used to land at Kagel, thanks to the efforts of William Bennett. Unfortunately, this phone attracted kids from the neighborhood and it became a popular hang-out at night. Later, when the landing area was moved sough to its present location across from Uncle Bill's house, William Bennett contacted the phone company to have the phone moved, and agreed to pay the cost of installation himself. Uncle Bill agreed to pay the power bill for lighting the phone. 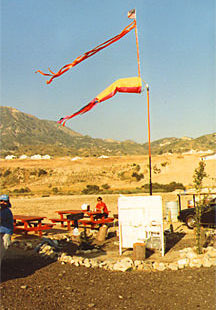 The moving of the landing area was the result of the First Annual Sylmar Fly-In and Barbecue on January 3, 1982 (see Hang Gliding, May 1982). Sponsored by Windsports, Progressive Aircraft, Delta Wing, and Hang Gliders of California, the proceeds were used to bulldoze a new landing area. Rich Grigsby organized a cross-country competition with eight pylons, each one a large symbol which the pilots had to write down, and land at Kagel in as little time as possible. In my opinion, this was the most enjoyable flying I have ever experienced, and I hope some day Rich will run a similar competition. 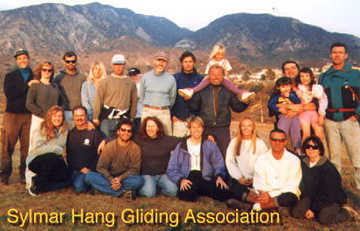 The first USHGA sanctioned competition at Kagel Mountain took place in May 1983, when the Manufacturer's League Meet came to Sylmar after three years at Crestline (see Hang Gliding, September 1983). The Big Boys tore up the skies of Sylmar in heavy competition, and when the dust settled, the Sensor team from Santa Barbara came out on top. In early 1983, Joe Greblo learned of plans to build baseball diamonds at our landing area, and he heard that the City of Los Angeles was holding meetings to hear community input. The City Planning Department required the land owners to accommodate all of the community needs before beginning construction of a trailer park on the plateau east of the Pacoima Wash. Fortunately for us, Joe began attending a series of meetings until hang gliding was included in the final plans. Thus, our landing area will someday be developed into a permanent flight park. Just as Joe had established good relations with the City, the pilots at Kagel were busy establishing poor relations with the residents. Mrs. Chaney, a resident at the north end of Gridley and a retired Doctor of Psychology, knew what was needed: to deliver a message to the pilots, and she did so by writing a letter of complaint to the newspapers and City Councilmember Howard Finn. She complained of invasion of privacy, pilots asking to use her bathroom, use of her yard for same, the use of her trash cans, crashes into neighbors' homes, dogs not on leash, noise, and constant use of the pay phone. Despite their complaints, she and Mr. Chaney, a former sky diver, do not hate hang gliding. They just want to secure their safety and privacy. An article appeared in the L.A. Times and Herald Examiner newspapers describing the seriousness of the situation. 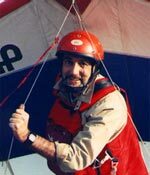 Jay Fred Lucas, having just finished recovering from shoulder injuries (see Hang Gliding, July 1983), read about Finn's proposed regulation of hang gliding. Jay sprang into action. He contacted Councilman Finn, went to the USHGA for mailing labels of L.A. County members, typed a letter, and pied for printing and postage himself. The letter started with an announcement of a pilot's meeting on October 30, 1983, at 3 p.m. in the landing area. Jay explained in his letter Finn's proposals,, the new mobile home park including plans to build baseball diamonds and a hang gliding landing area, and warnings to stay out of the heliport air corridor, especially when launching at the Towers takeoff. Councilman Finn's proposals included possibly banning hang gliding in Sylmar completely! The day of the first pilot's meeting brought rain, and 73 pilots crowded into Uncle Bill's garage to organize the SHGA and elect officers. Four consecutive pilot's meetings brought damp weather! Two of these meetings were held at Shakey's Pizza on Foothill Blvd. A petition drive, also on a rainy-day, was an idea of Rome Dodson's and organized by Craig Baker. The results showed Councilman Finn that better than 95 percent of local residents are very much in favor of hang gliding in Sylmar. The City Council formed an ad hoc committee including all interested parties to study the situation, and eventually the SHGA was allowed to continue self regulation. 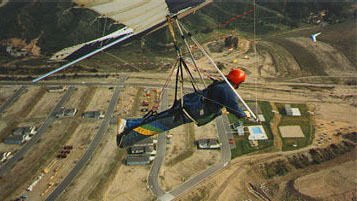 Visitors to Sylmar can receive a booklet from the Sylmar Chamber of Commerce which includes the following: "Sylmar is one of the most perfect places in the United States to hang glide, due to the excellent condition of the wind drafts and currents." Few pilots realize that most other flying sites in the country are seasonal, that is, they are soarable during only part of the year. Kagel is soarable year-round. Add to that the fact that Kagel Mountain is central in a county of over 12 million people, and you see just how unique this flying site is. Self-regulation is the easiest way to continue our sport in Sylmar, so let's keep the SHGA, and hang gliding, going forever. An 9important lesson can be learned form the History of the Kagel Mountain Flying Site! *Thanks to Wayne Yentis for the photos.